Back & Neck Pain Relief in Lake Orion! Lake Orion Chiropractic, P.C. 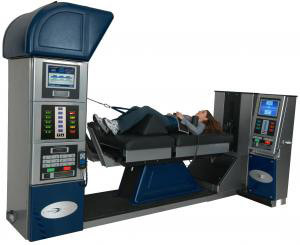 Provides Back and Neck Pain Relief utilizing the DRX9000 Spinal Decompression system. If you suffer from Chronic or Severe back, neck, leg or arm pain and have had little relief from medications, shots or other treatment modalities, then you may be a candidate for Non-Surgical Spinal Decompression in Lake Orion. At Lake Orion Chiropractic we offer Spinal Decompression Therapy! This medical breakthrough has provided an answer for countless neck pain, arm pain, back pain and leg pain sufferers where other treatments have failed. This section provides answers to frequently asked questions about Spinal Decompression, Streaming Video to see and understand how Spinal Decompression works and what to expect during a treatment. Also read testimonials from actual patients just like you. Spinal Decompression was designed by a specialized team of engineers to meet the needs of today’s patients, offering physicians the clinical outcomes they strive for, and patients the quality of life they deserve. With our focus on innovation, we are committed to utilizing the latest cutting-edge technology to improve the quality of life for those suffering from herniated discs, degenerative disc disease, spinal stenosis and other spinal injuries. Call our Lake Orion office today at (248) 393-1211 to see if you are a good candidate for Spinal Decompression Therapy. Spinal Decompression right here in Lake Orion! Lake Orion area residents don’t have to live with that pain anymore. Thanks to the concerted efforts of a team of top physicians and medical engineers, Spinal Decompression was developed to effectively treat lower back pain, sciatica, neck pain and arm pain resulting from herniated discs or deteriorated discs. Spinal Decompression not only significantly reduces back and neck pain in many patients, but also enables the majority of patients to return to more active lifestyles. Spinal Decompression has been proven effective in relieving the pain associated with bulging and herniated discs, degenerative disc disease, sciatica, spinal stenosis and even relapse or failed back surgery. Since its release, clinical studies have revealed an amazing success rate in treating cervical and lumbar disc related problems with Spinal Decompression Therapy. Spinal Decompression uses state of the art technology to apply a distraction force to relieve nerve compression often associated with neck pain, arm pain, low back pain and sciatica. Watch our video or read our “e-brochure” for more details. How do I get started with Lake Orion Spinal Decompression Therapy? Contact our Lake Orion office at (248) 393-1211 to schedule an initial consultation with Dr. Iulianelli to determine if you are a candidate for care with Spinal Decompression. After carefully studying your case history and exam findings, Dr. Iulianelli will sit down and explain his recommended plan of action for you. After answering any questions you may have about the recommended plan, you may begin your care with Spinal Decompression.